The next two weeks are big for the Iowa State Cyclones who open a two-game homestand against Oklahoma State. At 5-4, the Cyclones need another victory to become bowl eligible. 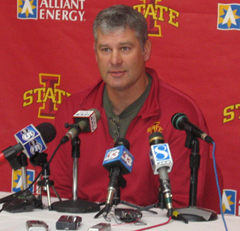 Iowa State coach Paul Rhoads says it’s extremely important and they have played well at home. He says the Cowboys are a tough team to start with. Rhoads says the Cyclone defense will need to do a better job of handling Oklahoma State’s speed than it did last week in a loss at Texas A@M.
He says they were exposed and had to make plays in the open field and did not do that and will have to shrink the field down this week and get more players to the ball. Rhoads says the key for the Cowboy offense is quarterback Zac Robinson. He says the spread offenses are all better served with a quarterback who is dangerous with his feet and arm and he says Robinson is that type of quarterback.